Why it matters: Although the project will take decades to complete, it will allow scientists to explore areas of physics that have never been possible before. This includes antimatter, dark matter, and the Higgs boson. CERN, the European Organization for Nuclear Research, has released a proposal to build the biggest and most powerful particle accelerator in the world. 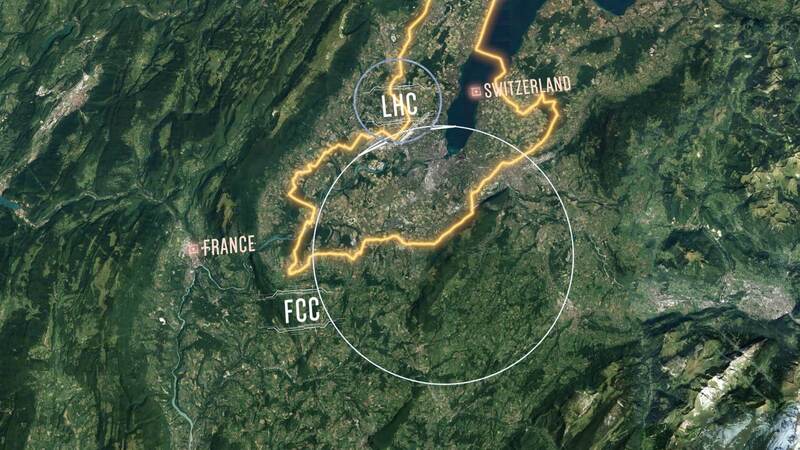 The collider they currently have, the Large Hadron Collider (LHC), is roughly 16.6 miles around, but their new accelerator will be 100km (62 miles) around. This endeavor, known as the Future Circular Collider, will be constructed underground in the area near the current LHC. It will surround Geneva and pass through Switzerland and France giving scientists even more insight into particle physics. CERN is famous for producing many ground breaking discoveries in the field of particle physics, most notably the discovery of the Higgs boson. With the LHC, CERN already had the most powerful atom smasher in the world, but science sleeps. The accompanying video includes testimony from many of the scientists working on the project including Nobel Laureate Peter Higgs himself. These massive machines work by accelerating particles to nearly the speed of light and them smashing them into one another. By analyzing the collisions and resulting subatomic particles that fly off, scientists can dig deeper into the building blocks of our universe. Projects like this take decades to realize, so many of the scientists who will eventually be working on the FCC haven't even been born yet. After the LHC was introduced, it took 10 years to be approved, and another 15 years after that until it was operational. The much larger FCC project is expected to span over 70 years. This week's report is the culmination of 5 years worth of work from 1,300 scientists and lays out plans for many future designs. With this new collider, scientists hope to explore antimatter, dark matter, and further explore the Higgs boson. Although the LHC provided many insights, it also created questions that can only be answered with a more powerful collider. This project will come in several phases. The first phase will complete by 2040 and will consist of building the $5 billion tunnel and a $4 billion lepton collider. This device would smash electrons and positrons (the antimatter variant of an electron). Around 2050 or 2060, scientists will upgrade it to a $15 billion hadron collider to smash protons. Scientists in China have also released plans for a 100km collider of their own.